The King Arthur legend moves to the modern day, where Excalibur is taken up by a young woman who is destined to wield its power, in The Once and Future Queen, from Amelia Cole creators Nick Brokenshire, Dj Kirkbride, and Adam P. Knave. The series, which will debut in March from Dark Horse Comics, features a 19-year-old chess prodigy who pulls the sword from the stone to become queen. "Now, magic, romance, Fae, Merlin, and more await her! Lend her your axe as the creators of Amelia Cole start a new age of adventure," says Dark Horse. With less than a month before the series' first issue hits the stands, ComicBook.com joined Kirkbride, Knave, and Brokenshire for a conversation about the series. You can pre-order a copy at your local comic shop, or a digital copy here. So we talked quite a bit about Amelia Cole during its run. What would you say to fans of that series who are coming into this one? What's different about the main characters and what, if anything, is the same? Nick Brokenshire: For me, all the characters in The Once and Future Queen are a little more rounded out. Rani particularly. She is a more complex person, careful and reticent while still being courageous. There's something about the interactions in this book that strike me as more relatable. Adam P. Knave: Nick is onto something there, opening the page count (12 or 14 for an issue of Amelia, 22 for Queen) allows us to dig deeper into character moments in different ways. DJ Kirkbride: We also have thirty issues of comics under our collective belts, so we've learned a lot. Fans of Amelia Cole should find similar enjoyment in The Once and Future Queen. It skews a little older, and we get a little edgier, but our primary goal is always to entertain with interesting characters, exciting stories, and, thanks to Nick, amazing visuals. Nick's look evolved a lot during Amelia. Will you still be kind of growing on the fly throughout Once and Future Queen, or as a smaller project does this have a more distinct look? Brokenshire: Amelia was a huge testing ground for me. I was figuring a lot of things out during those years. 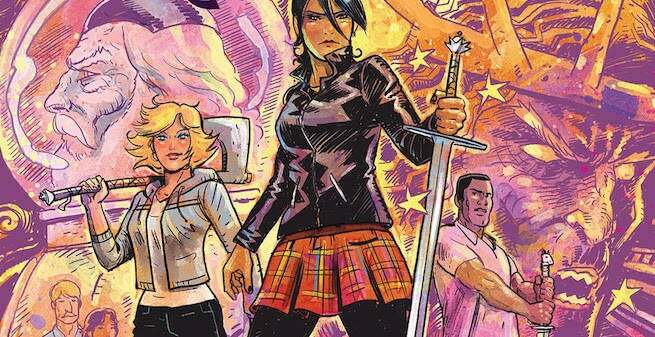 You will find a far more coherent and fully realized style in The Once And Future Queen. My approach to drawing and colouring was worked out before even starting issue one. The style I settled on tightens up slightly as the issue go on, but nothing you'd notice, I think. Kirkbride: Adam and I have been fans of Nick's since we were first introduced to his work, and it's been wonderful to see him just get better and better. It's also been a little infuriating to the frustrated artists in me. His name is also D.J., and he just doesn't have what it takes to draw a comic, dammit. There are a lot of elements of Arthurian mythology that everyone can recognize. Will there be some more obscure elements you guys are bringing in? Knave: It isn't so much obscure elements so as changing elements to doing our own thing. We've felt free to reinterpret the myths and, going forward, that can lead to unexpected results. Brokenshire: I was all for incorporating the little known Arthurian myth pertaining to the 'Mystical Bottom Ticklers of West Sussex' who famously helped Sir Gawain out of his mail under-trousers only to leave him stranded atop the Elohesra Mountain with his nethers revealed unto the sky. I was shot down, but I'm going to try and sneak it in somewhere. Kirkbride: I can't believe you just spoiled the big twist, Nick! Now we have to rewrite issue 5. I hope Mr. Frank Cvetkovic hasn't started lettering it yet! What's the sense of humor in the book like? Kirkbride: Everything the three of us do is going to have some humor in it, but this book is a little more serious overall. A lot of that has to do with the main character. Rani isn't as punny or goofy as Amelia. She's more analytical and serious whereas Amelia used humor as a defense mechanism when situations get out of control. There are definitely some goofy moments, just in how regular people react to myths being mostly true and monsters invading and whatnot. Gwen is pretty boisterous and gets most of the intentionally funny dialog, whereas Merlin's funny without realizing it. For the most part, the danger and action supersede the chuckles, though. Brokenshire: After Gawain found his under-trousers underneath a particularly prickly mullberry bush he was set upon by a huge Trollwench. She was ever so taken by his rosy posterior... Again, shot down. I may have to do a side project. Knave: I think the big hope right now is that we will be able to publish Nick's shot down side notes as a companion volume. What's the biggest difference working on a project like this with Dark Horse versus on your own? Knave: Oh Nick. We don't say no, we say "not yet" one day all your dreams will come true. But yeah having other people involved has been endlessly helpful. We all got really good at editing ourselves and double-checking where we were going and such, but having Shantel LaRocque at the helm allows us to focus down a bit more and also gives us an amazing net to catch us. Her notes and availability to let us bounce ideas off of her has done nothing but improve the book. Kirkbride: On Amelia Cole, Adam and I tried to act as co-editors as well as co-writers, and that works to an extent, but Shantel's objective eyes make a huge difference. It feels a little safer for us, because we have her and our assistant editor Katii O'Brien looking out for the book, too. Obviously the smaller stage of a miniseries means you did some things in Amelia that you cant' do here. What can you do in this book that you couldn't in Amelia? Kirkbride: This book's more on the "adult" side of "young adult" than Amelia Cole was, which means we can push boundaries further. This comes across in terms of the violence-level and scares in the action as well as the relationships between the characters themselves. It's less about dropping an s-bomb here and there (though we do do that) and more about getting deeper with these people and exploring aspects of life that weren't appropriate for Amelia. Brokenshire: I've had the challenge of drawing a few things that one certainly would not see in a young 'uns book like Amelia Cole. Look out for a scene in issue three that I would say is distinctly non-all-ages. Unless you come from Sweden, in which case it's your typical pre-six o'clock fare. You'll see. Knave: Well hold on, these two just went along with your premise which I flatly reject. There is nothing in Amelia we couldn't do here. I assume you mean the long term planning done in Amelia, really, and well - we can and do. We just do it in a way that if any volume is the last everything wraps up. That doesn't mean everything is answered and has a bow on it. We have plans. Kirkbride: I just realized that, uh, I actually didn't answer the question, did I? I kind of answered the opposite of the question, saying the things we CAN do here that we COULDN'T do for Amelia. How accidentally sneaky of me. Was this one always planned to be a physical-first release? Kirkbride: It was indeed. We wanted it at a publisher we respected, one who could give it a nice push while also letting us retain creative control. Dark Horse is the ideal place. Hannah Means Shannon got it there, and our editor Shantel LaRocque has been a great objective eye and guide, while always letting us create the story we want to tell. Knave: Yeah we were just mad at trees one day and here we are. Kirkbride: There is something about knowing there will be a little less oxygen in the world on account of our comics. We're at a moment in comics where there's a lot of talk about representation, and you're taking a traditionally white, male mythology and applying it to someone who's not. Was that a "statement" or just kind of the hook you landed on for the series? Brokenshire: Personally, for me the statement is 'I am bored of the same old stories about the same old white dudes'. I want to see what happens when a half-Indian punk girl is confronted with the stuff Arthur was confronted with. I don't need to know what Arthur did because I read that when I still in the womb. Over and over. Why is Love and Rockets so great? Because girls are more interesting than boys. Knave: For me it was just how the story worked out. If you're going to do a modern version of the legend you have to be willing to look at every bit of it and that includes "Well is there a reason it is a white guy past the fact that historically it would have been?" and then you open the door to other ideas. We just really dug Rani, as a character, and wanted her to helm the book. The rest fell into place after that. But it was never anything that was sought out, or a gimmick or statement. It is just our story. Kirkbride: Representation IS important. So important. I got to grow up as a white male with a big jaw and dark hair reading about a bunch of characters who kinda looked like I could've looked when I grew up if I'd, you know, exercised more and laid off the burritos a little. And we have more than enough of those types, frankly. It has to work for the story, though, as Adam said, and for this one, it adds texture to the book. These characters are challenging to write in great ways, and I've learned a lot in the process of working on the series. We get some pretty distinctive, and some kind of oversized, weapons. And obviously the wrench was a big part of Amelia. Nick, is it you or somebody else who puts a premium on cool weaponry? Brokenshire: I signed a contract with Dark Horse. I have to provide the appearance of at least two outrageously cool glowing weapons per issue. It's a heavy responsibility that I am more than willing to shoulder. I particularly like the fae swords. They had to be badder than the Uruk Hai's swords in The Lord Of The Rings. I feel my Fae weapons would mess you up. Knave: I've seen the contract. Nick wrote it himself. In crayon. Oddly though, still legally binding. Kirkbride: It's also utterly charming. How would you compare this series to the classic '80s animated series Silverhawks? Kirkbride: While our heroes don't sport shiny metal skin (yet), and guitar playing space cowboys (though Lance could pick up the guitar as a hobby at some point), it will resonate with fans of Silverhawks who enjoy quality storytelling that has nothing to do with Silverhawks. Readers might see a little of Commander Stargazer in our Merlin, as he is the one who brings the heroes together, though. And while Rani, Gwen, and Lance are not "partly metal, partly real" (metal isn't real? ), their weapons ARE metal, so there's a correlation there. Our hope is that someone who watches Silverhawks on a daily basis, likely in their Silverhawks PJ's, munching on a bowl of sugary cereal (as Adam does), will like The Once and Future Queen enough to turn off the TV at least once a month to read and an enjoy an issue. Brokenshire: I never saw that show here in the UK. I'll tell you what I did see. I watched a thing called Rentaghost which had a medieval court jester ghost haunting this bloke in the 80's. It was brilliant. Knave: I swear, you make one (all right, like five) Silverhawks jokes and it comes back around to haunt. Queen is nothing like Silverhawks. Obviously. It's like Thundercats. Which was exactly like Silverhawks. Duh.